If there’s one piece of advice I can offer you, both for better text mining and better writing, it is this: please, please, please with a cherry on top, be clear with your pronouns. There’s nothing that makes me more sad than a lost, lonely pronoun separated from its antecedent, or the noun to which the pronoun is referring. The process of determining pronoun ownership, and thereby determining who or what is being spoken about in a particular phrase, is something we call anaphora resolution, and it’s something we’ve been working on for a long time. If we were to say “Jenny wanted to try something new, so she went to yoga class”, anaphora resolution would be identifying the pronoun “she” as referring to Jenny. 1. How far apart are the pronoun and referring noun? 2. Do the pronoun and the referring noun look alike? Distance is a good way to track the referring entities. Good writers, like good pet owners, keep their pronouns on a short leash. If the pronoun is “she”, for example, in all likelihood, the person being referred to will be the last woman introduced by name, and will be in the previous sentence, or at least in the same paragraph. Ex. “Jenny met a guy in yoga class. She is going on a date tonight.” This is obviously easier to figure out if the woman in question has what is traditionally understood as a female name like Jenny, which brings us to our second strategy for anaphora resolution. If pronouns and nouns “look alike”, they’ll share a certain quality that allows us to rule out other antecedents. As in the instance above, the pronoun “she” is most likely attached to a woman’s name. Ex. “Jenny and Dave went on a date, but she faked food poisoning to get out early.” In this instance, “she” is probably not referring to Dave, because Dave is a traditionally male name. The same principle holds true for nominal pronouns. Nominal pronouns are the kind of pronoun we employ when we write “the company” in an article when we are referring to, say, Google. We know which company is being referred to, because it is the topic of discussion, but we aren’t using the proper noun. In this case the look-alike strategy works very well. 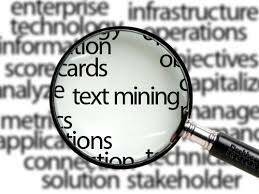 For example, Lexalytics’ text mining engine Salience knows Google is a company, and so can easily attach it to the nominal pronoun “the company”. Salience also looks for other qualities to ensure the best anaphora resolution possible. For instance, it looks for quotation marks in conjunction with the use of the pronoun “I”, so that it doesn’t confuse the author with someone else who is being quoted. For example, “‘I’ll have to find a new yoga class,’ says Jenny”. The “I” is in quotations so it belongs to Jenny, the speaker. However, when I use “I” without quotations, the pronoun belongs to me, Mekkin, the author. But it’s not all fun and games. Not when it comes to the unfathomable “it”. With its lack of defining characteristics, it can cause text mining mayham. For that reason, most text mining engines choose to ignore it altogether. That’s all for today. Please remember to be a responsible writer: spay and neuter your expletives, and keep your pronouns close to home.